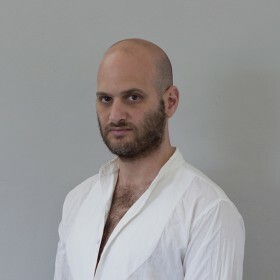 Born in Tel Aviv, 1970. BFA and MFA from the Departments of Photography and Fine Arts, Bezalel Academy of Art and Design, Jerusalem and Tel Aviv. Recipient of the Young Artist Award, the Israeli Ministry of Science, Culture and Sport (2000), the Young Photographer Award, Haifa Museum of Art (2005), a prize on behalf of the Heskia-Hacmun Law Firm (2007) and the creative encouragement award on behalf on the ministry of culture (2012). Gershuni has had solo exhibitions at the Tel-aviv museum of art, Haifa museum of art, and the chelouche gallery, Tel Aviv, among other venues, and participated in numerous group exhibitions in Israel and abroad. Gershuni published two artist books titled: day and night and yesterday's sun. He is represented by chelouche gallery in Israel.